The Ritterman Building’s Living Wall has featured in a new BBC series about pollution called ‘So I Can Breathe’. 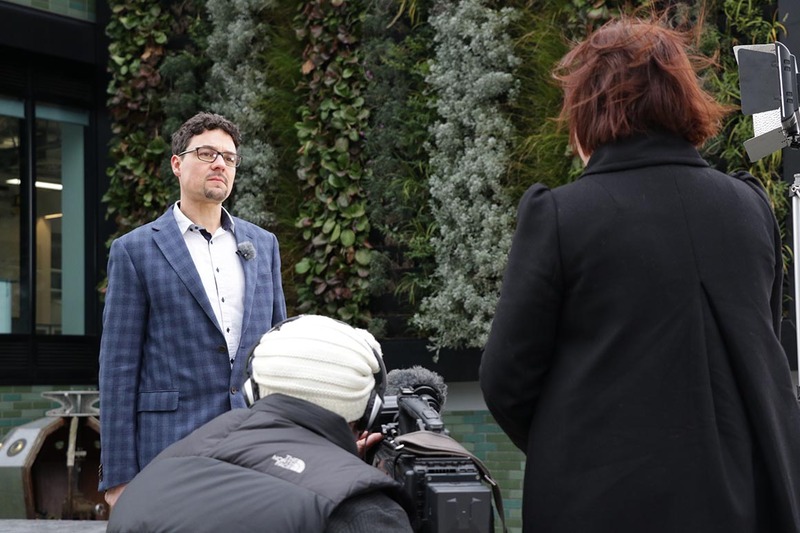 In the segment shown on BBC London this week, Senior Lecturer in Bioscience and Biomedical Science Dr Dirk Wildeboer talked to journalist Anna O’Neill about his research exploring the potential environmental benefits of living green walls in urban spaces. “Plants have numerous benefits to the urban environment including the improvement of air quality,” says Dr Wildeboer. “As space is often limited in built-up environments, the installation of green walls on existing buildings or the incorporation of living structures into new buildings provides an innovative solution to urban greening. Several of the external-facing walls on the brand new Ritterman Building, a purpose-built teaching and learning space, are covered in thousands of plants will help capture, store and recycle rain water. As well as its green walls, the Ritterman Building features a bio-diverse green living roof, solar panels to generate electricity and energy-efficient lighting controls. Middlesex is committed to continual environmental improvement and in recent weeks the Students’ Union has begun working with the London Wildlife Trust to plant wildflowers and hedgerows and build log piles in order to encourage more birds and insects to make a home on campus.